Lockwood Marinas@ Cove’s Edge Marina offers boat slips, full service boat maintenance, boat repair and boat storage. We have a family boating focus and provide all of your boating needs from seasonal dockage and off-season storage to haul out service, marine service and access to rentals. Cove’s Edge Marina offers up to 100 slips and can accommodate power boats up to 30 feet in length. Each slip features upgraded shore power and fresh water hook-ups. At Cove’s Edge Marina we take pride in making your boating experience as enjoyable and turnkey as possible. Our well trained operations staff will see that you and your boat are well cared for at anyone of our locations! Make sure that they can withstand what’s coming. Our expert shrink-wrapping services ensure that rain, sleet, or snow won’t negatively impact your marine vehicles. Call Cove’s Edge Marina to inquire about our affordable rates and reserve your winter storage spot today. Cove’s Edge Marina has a fully equipped repowering and rigging shop. We can replace a shroud, modify the backstay, make a whole new set of standing rigging, or new lifelines with gates. If you are in need of quality repowering and rigging services contact us today. Cove’s Edge Marina recommends power washing at least once throughout the season, as this will prevent bottom drag and increase fuel economy. 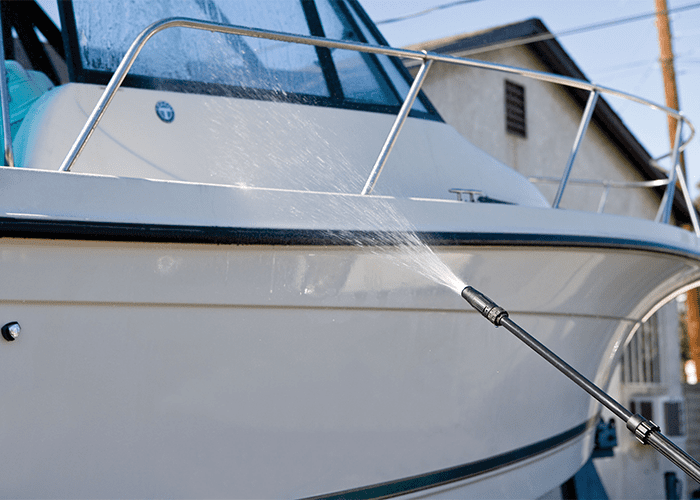 Most boaters are surprised by the dramatic change in performance by simply power washing. Call us today, contact us online or just stop in to schedule your power washing cleaning today. Cove’s Edge Marina enjoys a well-earned reputation as a top full service and repair marina in the Watch Hill RI section of Westerly RI. Each one of our marina’s has a hand-picked team of experienced technical staff on hand. From re-powers, commissioning and decommissioning, general diagnostics and detailing, to hauling and launching via our forklift, let our crew keep you up and running this season. Simply stated, Cove’s Edge Marina’s offers a wide variety of services and we pride ourselves on delivering the highest level of customer satisfaction.